Tall Pine, California, is a Christmas town. It has a year-round Christmas store, Snowed Inn (a Christmas-themed hotel that serves hot chocolate that may have a magical effect), a tree-lighting tradition as old as the town, and annual Santa sightings. It may be Bret Radner’s hometown, but it is a poor fit for a man who hates Christmas. Seven years ago, Bret finished up a prestigious internship with the Washington Post and was looking forward to a career as a high-powered journalist when a phone call brought him home to spend four months watching his mother die of cancer. She died shortly before Christmas. Bret remained to care for his ailing father, but he has avoided everything to do with Christmas, from lighted trees to mistletoe to church services. As a reporter for the Tall Pine Gazette, he writes articles about town council meetings and school test scores that leave him longing for more important subjects. When his editor is sent to Chicago to straighten out a problem there, Bret eagerly accepts the position of acting editor. He is less enthusiastic about his boss’s hiring a freelancer as the Gazette's newest staff writer, albeit a temporary one. Chloe Davenport always wanted to be a writer but journalism was not what she had in mind. However, she has enjoyed her freelance work for the local paper, and she approaches her new job as a full-time reporter with optimism. That optimism is soon tempered by the reality of working with Bret, a demanding editor with the temperament of a less miserly Scrooge. 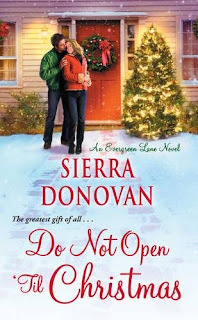 The sunny-natured Chloe and Bret clash over her story ideas, many of which are connected to Christmas, and he is horrified by her lack of journalistic experience and her ignorance of AP style. Chloe feels as if she can never please him. Some days only coffee and pie and the sympathy of her roommates keep her going. Despite their differences, Bret recognizes Chloe’s writing talent and mentors her to good effect, although in a mostly curmudgeonly fashion. Chloe learns from him, and she also learns that there is more to Bret than his dour image. These opposites do indeed attract, but for every step Bret takes toward Chloe, he retreats two. Even Chloe recognizes the problem of a relationship between her and her boss. It will take a near tragedy to resolve all their issues. Chloe’s life and her human interest features give the reader a look at Tall Pine, its traditions and its people. There are heartwarming encounters with a wounded veteran, a lost-and-found kitten, and Chloe’s family and friends. Fans of Donovan’s earlier Evergreen Lane books will be pleased to see appearances by Mandy and Jack Wyndham (Do You Believe in Santa?) and, more briefly, by Liv and Scott Leroux (We Need a Little Christmas). Appropriately, given Bret’s reserve, his contacts are more limited. The term “gentle romance” is a perfect description of this book. Tall Pine is an idyllic holiday setting. If it seems too slow-paced for an American town in the twenty-first century, that is also part of its charm. Bret and Chloe’s romance is strictly kisses-only, and even kisses are in short supply. My reaction was mixed. I admit that Do Not Open ‘Til Christmas has the appeal of a Thomas Kincade Christmas card, and I am enough of a sentimentalist about the holiday to be seduced by that quality. On the other hand, I like deeper character exploration than this book offers. I felt that my understanding of Bret and Chloe was too superficial to be satisfying. If the verbal version of sugar plums is your idea of a holiday reading treat, you will likely enjoy this book. If you anticipate something spicier or more substantive, you probably want to give this one a pass. Thanks PJ, this sounds like a fun read too. So many books and never enough time. Sounds Good. Is it a new release? Will have to ck it out.